At the end of The Three Body Problem humanity had discovered that the civilisation of Trisolaris had sent its fleet towards Earth with the aim of taking the planet and rebuilding Trisolaren civilisation in a more stable solar system By the use of artificial intelligent protons the aliens were in contact with a shadowy organisation working on their behalf despite the vast distances between the two systems. Humanity has hundreds of years to prepare but the situation looks grim. The Dark Forest picks up directly from there. Humanity is busy trying to work out what to do, build some kind of defences in space and to find away past the interference in scientific research caused by the ‘siphons’ (the smart elementary particles that allow the aliens to act on Earth). What follows is a tale that covers a couple of hundred years of humanity coping with the changes in technology and outlook in the face of what appears to be impending doom. The book has the same heady mix of ideas and speculation that makes the plot and direction largely unpredictable. Unfortunately it suffers from the same thin characters and a tendency towards clunky exposition. At the same time it lacks the powerful historical grounding that made The Three Body Problem feel like a novel that went beyond speculative fiction. 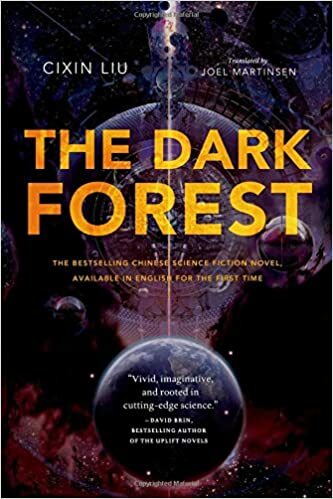 If you didn’t like The Three Body Problem then The Dark Forest is certainly not going to win you over. The first 10% of the book is also tough going but eventually the story settles in a rhythm as humanity explores its options in the face of the approaching threat. Novel, original and brimming full of ideas but not as brilliant as its predecessor.